Quick overview: The Newsuem site (www.tinyurl.com/newseum) allows your students to read the front page of different newspapers from all over the world. The newspapers are updated every morning. How it can be used in the classroom: As a teacher, the Newseum website could be a great ICT resource to keep in your “back pocket” for a day when a worldwide news event happens. Using the Newsuem site, do your students find that newspaper headlines in one country minimize or emphasize this big news event? Is the news event positive in one country and negative in another? In addition, the content on this site is about as real life as it gets and could be a great way to incorporate ICT into a real life Learning Situation. Other useful links on the site: There’s also an archive section on the Newsuem site (www.tinyurl.com/newseum-archive) that highlights recent events of historical significance. However, due to legal reasons, the Newseum site is not authorized to archive newspaper front pages from other prior dates. If ever you find the newspaper text hard to read, be sure to click on the “readable PDF” link found with each newspaper front page for a higher resolution image. Last but not least, teachers should keep in mind that only the front page of each newspaper is provided. 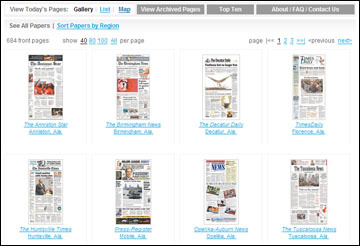 However, a web site link is available for each newspaper so that students can visit their websites to read more. This entry was posted in Tools and Apps and tagged front page, news, newseum, newspaper. Bookmark the permalink.